^^ I don't condone wearing tights as pants. I'd like to make my position clear: ugh. But Kmart has a tough dressing room policy: only 4 items and you have to bring them all back to get 4 more. Yes, annoyingly inflexible (although I'm always highly entertained by my Kmart dressing room attendants, never a dull moment back there). Anyway, I was wearing a dress that day and was not going to change back into my clothes to grab a pair of pants. Thus those cute grey tights, $6.99 on sale in Juniors, also come in other colors including basic black. Cute dresses, all Piper & Blue, & all 30% off $19.99. I'm thinking perfect poolside. I really wanted to buy this star dress (on sale, $17.49), but can't get over feeling/ looking like a constellation powder puff. 2nd favorite item, striped summer sweater on sale for $13.99, also comes in yellow & grey stripes. No buttons, hangs cute. 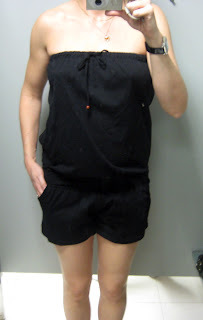 And I really want a cheap little romper, aka jumpshorts, for summer days, this one's on sale for $11.89. I LOVE that white blouse! THANK YOU for making your position crystal clear. I could not agree more. You can wear the star thing when you are preggers! Farren - that's exactly what I was thinking when I was at Kmart! And I thought those leggings looked familiar...when are you coming to nyc to be my intern???! LaC - me too, so impressed, a great spring/summer blouse. Sister Wolf - I'd have to be REALLY preggers. Like 9 months. Sal - The eternal optimist! Unfortunately a belt on me would look even worse. Yiqin - I'm not totally against leggings as pants if they aren't see-through, eg: if they are cotton, but nylon tights, def. no! Cammilla - exactly, so cute in theory, not so much irl. The turqouise dresses are so beautiful, and the jumpshorts look fabulous!! 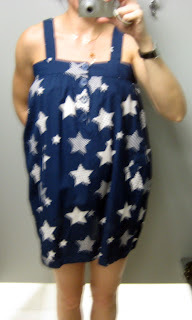 Meh, tis a shame about the shape of that star print dress, it would be cute in another cut. that stars dress is really funny though. i'm kind of thinking about it. wish i wore that during my trip in dc!